OSENSA Innovations develops and manufactures fiber optic temperature sensor products for industrial applications including power transformers, switchgear, generators, semiconductor, and MRI equipment. Fiber optic temperature sensors are solutions consisting of one or more fiber optic probes attached to a temperature transmitter (also known as signal conditioner) electronic device. OSENSA’s fiber optic sensing technology is transforming the temperature sensor industry by enabling industrial-grade fiber optic solutions that are price-competitive with conventional wired thermocouples and RTDs (resistive thermal devices). Furthermore, OSENSA’s fiber optic temperature sensors are more durable and easier to install than competitive optical technologies. OSENSA’s fiber optic sensors are immune to electromagnetic radiation and compatible with high-voltage, high-RF (radio frequency), and high-magnetic-field environments, making them ideal for applications where thermocouples and RTDs fail. OSENSA’s fiber optic temperature sensor solutions include the FTX series of temperature transmitters (also known as signal conditioners), fiber optic temperature probes, extension cables, various accessories for ease of installations, and monitoring software. OSENSA’s temperature transmitters offer exceptional speed and precision and have the same look and feel as traditional transmitters, including familiar analog outputs and digital buses such as RS-485. Various fiber optic channel counts are supported, as well as probes that are optimized for a host of applications. OSENSA’s cost-effective fiber optic sensors provide continuous real-time monitoring of switchgear temperature at critical contact points to quickly detect over-load and fault conditions. 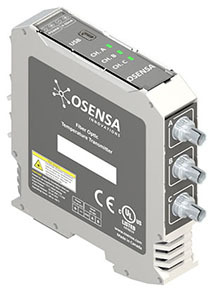 OSENSA’s FTX series signal conditioners offer both analog output and RS-485 Modbus communication for simple integration with existing PLC’s and host monitoring software. OSENSA’s optical temperature sensors provide years of accurate sensing to ensure safe and efficient switchgear operation. OSENSA’s fiber optic temperature sensors are completely immune to EMI/RFI and high voltage environments making them ideal for transformer winding hot spot temperature monitoring. OSENSA is developing technology and partnering with leading transformer manufacturers that require accurate, real-time, smart grid temperature monitoring of power and distribution equipment. On-line fiber optic temperature monitoring is now commonplace for medium and high voltage generator equipment. OSENSA’s fiber optic sensors offer a cost-effective solution for real-time temperature monitoring enabling equipment to operate at peak performance with extended service life. Various life sciences and patient monitoring applications require high-accuracy fiber optic temperature sensing. OSENSA offers single and multi-channel fiber temperature probes for MRI, NMR, and RF environments, including low-cost disposable temperature probes with fast-response and exceptional accuracy. OSENSA’s multi-channel fiber optic temperature sensors offer cost-effective and convenient temperature monitoring of industrial microwave processes including microwave assisted chemistry, microwave sterilization, and microwave sintering. OSENSA’s optical temperature probes for microwave environments may be constructed from Teflon jacketing materials for maximum chemical and bio-compatibility, or from rugged stainless steel and high-temperature ceramics. OSENSA supports research and development activities that require precise fiber optic temperature sensing solutions. OSENSA’s software and fiber optic probes can be customized and calibrated for a wide variety of laboratory and test applications. OSENSA Innovations manufactures low-cost fiber optic temperature sensors and signal conditioners for high voltage equipment monitoring including medium and high voltage switchgear, transformers, circuit breakers, and generators. Our fiber temperature sensors provide exceptional reliability, durability, and accuracy. OSENSA offers OEM optical temperature sensors and monitoring solutions to the world’s leading equipment manufacturers.